Streaming devices are a familiar concept to most consumers, particularly within the realm of media consumption. Having an XBMC- (now Kodi) or Android-based streaming device is common place, and one of the most popular has been the Raspberry Pi. In that instance the streaming device fetches the audiovisual stream from a storage location and relays that information to a connected display, usually through HDMI. Streaming media content is, however, significantly different from streaming the entire audiovisual output of a PC system. This specific use-case scenario has primarily entailed the use of remote-desktop software such as Chrome Remote Desktop, TeamViewer or the Windows Remote Desktop utility. In the case of the aforementioned remote desktop utilities the receiving end also requires a fully-functional receiving desktop, notebook, tablet or smartphone to interact with the connected PC. Complicated, huh? Adding further to the complexity is the fact that all the named remote desktop utilities cannot effectively handle full-screen 3D-accelerated applications, e.g. PC gaming, and such limitations, for example, have paved the way for a gamer's streaming platform - Steam In-Home streaming. It quickly becomes apparent in the streaming abyss that there is no single unified solution for media content, gaming or traditional remote desktoping. With that thought in mind NZXT's Doko, priced at $100, has stepped into the ring to deliver a unified streaming experience for PC users, emboldened by the short but effective slogan 'Your PC. Anywhere' which gives a clear indication of what NZXT is targeting with this device. Simply put, the Doko allows you to access the full-fat functionality of your PC using any HDMI-enabled display and USB peripherals. Despite its bold functional offerings the NZXT Doko is a remarkably compact and sleek-looking device, designed to be subtly integrated into the living-room environment. The Doko makes use of USB over IP technology to allow users to interact with their PC using standard USB devices - keyboards, mice or even game controllers. The audiovisual stream is compressed by the PC and sent, over the network, to the Doko device which proceeds to decode and decompress the stream before relaying the audiovisual information to a display and set of speakers. NZXT claims typical latency of 50-80ms for this process. In terms of its inner workings the NZXT Doko is powered by a WonderMedia 8750 processor based on ARM11 technology. This single-core 32-bit SoC operates at a frequency of 800MHz alongside a dedicated H.264 video decoding engine. The WonderMedia 8750 can be paired with DDR2 or DDR3 DRAM; NZXT equips 256MB of DDR3. On the networking side NZXT made a bold decision to stick with Gigabit Ethernet only meaning users hoping to pair this device up with a TV will need to make sure there is a wired route to the Doko. NZXT's justification for this wires-only approach is that only Ethernet is capable of delivering an optimal experience in terms of network throughput and latency. The primary audiovisual stream is handled by an HDMI input but there's also a 3.5mm jack for users who have speakers or a headset. The front of the device provides a generous number of USB ports, four in total, to give ample flexibility for multiple game controllers and other input devices. A pin-hole system reset button and large illuminated power button are also provided, but the latter could benefit from more tactile feedback. The setup process is relatively straightforward and stands out as a particular strength of the Doko device. 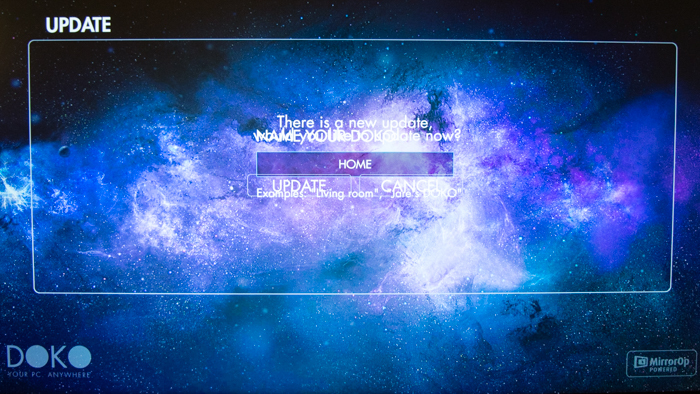 On first startup the software requires the user to name their Doko device before advancing with an update. Strangely this particular part of the UI is a bit messy with overlapping text and a seemingly misconfigured layout. The primary menu is cleaner and better constructed than the initial startup screen with ample options to configure the Doko with your PC, network or update its software. The Doko is as close to a dummy terminal as it gets - if the device isn't connected to a PC then it serves no other functionality. 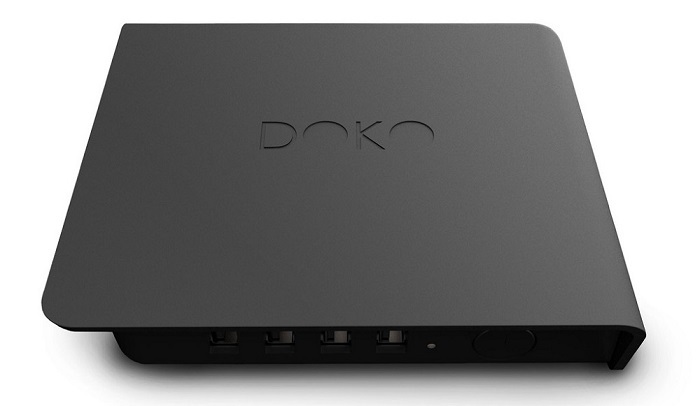 It would have been pleasing to see the Doko deliver SmartTV capabilities, such as media streaming or web-browsing, when it isn't connected to a PC. 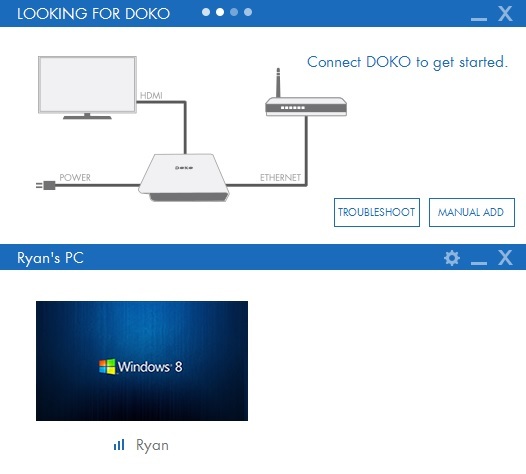 Getting the Doko prepared at the desktop PC end is even easier, requiring one simple software installation. The Doko Sender software package, developed by Awind, Inc., automatically searches the local network for the Doko and once found initiates a connection. 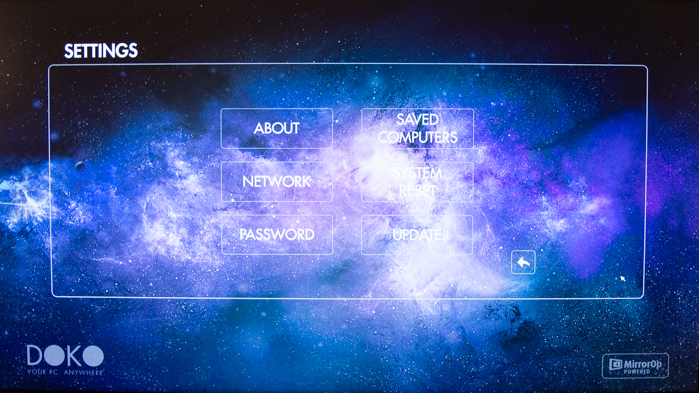 On the first connection the user is required to choose a password to protect their PC from unauthorised connection. USB devices are loaded on session initialisation only so if a device is plugged in after the session has started it will need to be reset for that device to function.